So to start our venture into the sphere of conservation challenges, we held our first discussion event on species reintroductions in November 2011. The excited (and slightly nervous) committee were massively pleased to see a huge turn-out. Luckily, the lack of access to a promised projector had us relocated into a bigger lecture room in the college, where the thought-provoking evening of talks could be heard by all. Dr. Paul Jepson, from the School of Geography and the Environment, immediately asked us to examine and question the existing structure of conservation action. Instead of just accepting the current framing of our interaction with nature, Paul suggested that we need to re-think how we preserve species and habitats. Rewilding, or the reintroduction of ecological processes into systems that have lost them, is an example of how we can do that. Paul referred to the increasingly famous rewilding project of Frans Vera, in Oostvaardersplassen in the Netherlands. 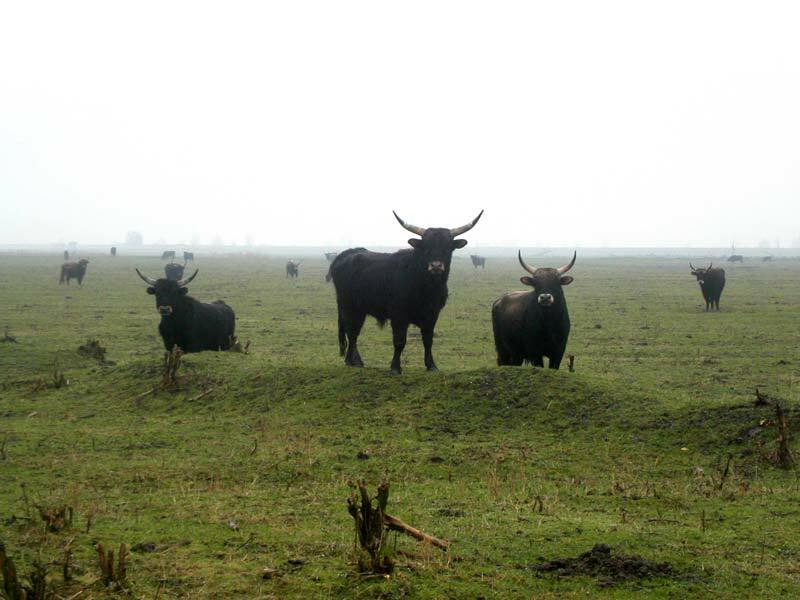 Rather than accept the intensive management carried out in many European national parks, Frans Vera has introduced Heck cattle, an ecological analogue of the extinct Auroch that once grazed across Europe, to the wetlands. Controversially, the system has been left to regulate itself, with the only human intervention being to cull sick animals in order to meet animal welfare standards. This hands-off approach is a stark contrast to existing conservation approaches in the region, and may promise to be more economically and ecologically viable than existing methods. Following this intriguing shake-up of current conservation norms, Dr Mark Stanley-Price, from WILDCRU, gave us an overview of his wealth of experience on species reintroduction programs. Whilst bringing back species to areas that have lost them sounds brilliant for conservation, Mark showed it is not that simple. Obtaining enough individuals to set up a viable population is one challenge is only the beginning. The amount of paperwork to be completed is then formidable. Once enough forms have been stamped, the animals have then got to deal with a stressful new environment, and the potential return of the threats that led to their decline in the first place. The widely acclaimed return of the Arabian Oryx to Oman, for example, suffered an increase in hunting. Eventually a huge area had to be fenced off to protect the herds. Whether they are still wild or not is something of a subjective judgement. Mark concluded that in many cases, reintroductions may not be the best use of limited financial resources. However, given the ongoing loss of habitat and connectivity across the world, combined with the climatic shift we will experience over the coming decades, we may only be left with the option of relocating threatened animals. Assisted colonisation, or the reintroduction of species to shifted climate envelopes, may become a central part of future conservation efforts. Following some tasty snacks and the chance to meet likeminded people over a glass of wine, we continued with a couple of case studies of how reintroduction programs have worked in the UK. Tim Mackrill led us through the heartwarming work of the Rutland Water Nature Reserve team, who have brought the Osprey back to the UK after 150 years. Tim showed us stunning images of the birds, and how the GPS trackers now attached to a few individuals are providing new insights into the birds’ migratory behaviour. Work with the Ospreys has also led the team to start an education program, linking up schools along the migration route. It is not only the Ospreys that are benefitting from this reintroduction program! The evening concluded with a hands-on look at some water vole radio trackers and the Osprey’s 30g GPS tracker… as well as the opportunity to finish off the wine and snacks (we wouldn’t ever want to contribute to food waste after all). Overall, the event was a great success, leading the audience through the achievements and challenges of species reintroductions, as well as providing an insight into the role reintroductions may play in future conservation efforts. It was really great to get some insight into Oostvaardersplassen! But I think it’s important to keep in mind that Oostvaardersplassen’s success can’t really be used as an argument for Pleistocene rewilding, as sometimes happens. Though both Oostvaardersplassen and the proposed introductions to N. America concern species that were never present previously, just closely related species with an approximately equivalent ecological function, there is a key difference. Though animals such as the Konik pony and Heck cattle are not the same species as the extinct Auroch and Tarpan (just partially), they have only been missing from the ecosystems only since 1627 and between 1875-1890 respectively, while North American Pleistocene rewilding proposes going back 13,000 years. ps. Interesting things similar to Oostvaardersplassen is also going on at Wicken Fen in Cambridgeshire!